New Delhi : (17/04/2019) BJP National Secretary Sardar R.P. Singh held a Press Conference at the Delhi Pradesh Office today on the promise made to the Sikh by Aam Aadmi Party in the year 2013, 2014 and 2015 that after coming to power they will send the accused person of 1984 massacre to Jail and insure justice to the Sikh Community and also entreating the Congress Party for alliance for Loksabha Elections which exposes the double standards of Aam Aadmi Party. Delhi BJP Vice President Rajiv Babbar, Sikh Cell Convener Sardar Kuldeep Singh, Media Co-Incharhe Neelkant Bakshi and Media Head Ashok Goel Devraha were also present in the Press Conference. Addressing the media persons, BJP National Secretary Sardar R.P. Singh said that the party which has 66 MLAs is begging for alliance with a party which has not a single MLA in the Assembly. Aam Aadmi Party has forgotten that in its Delhi Dialogue prepared after ascertaining the views of people of Delhi in 2015 had claimed that senior leaders of the Congress Party were guilty in the 1984 anti Sikh riots. Today, Kejriwal meets Sheila Dikshit and takes photographs with her. She is the person against whom he had claimed to have charges of corruption running in 370 pages and also talked about sending her to Jail. Congress Party is without any doubt involved in the massacre of Sikhs. Congress President Rahul Gandhi has not apologized to the Sikh for this massacre. He said that Aam Aadmi Party’s Head Arvind Kejriwal is adding insult to injury of the Sikhs by trying to form alliance with the AAP. 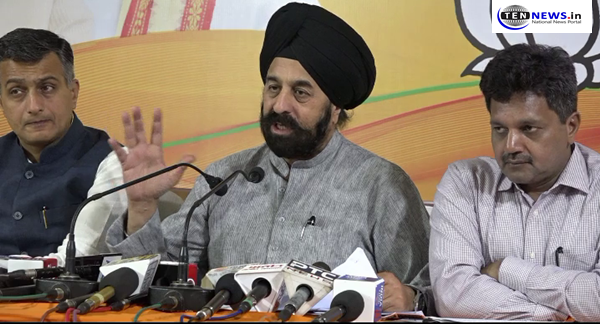 Sardar RP Singh said that Aam Aadmi Party had in its Election Manifesto 2013 promised that it will ensure punishment to the Congress leaders guilty for the massacre of Sikhs and ensure justice to the Sikh Community and that the cases which have been closed will be reinvestigated. There are many cases in which investigation has not been done properly or the witnesses have not deposed. CSSOS Signs Wrestler Sushil Kumar and Singer Guru Randhawa as brand ambassadors!